UNITED NATIONS, November 6 -- In order to requisition Darfur peacekeeping infrastructure services, in a way that resulted in U.S.-based Lockheed Martin getting a $250 million no-bid contract, the UN earlier this year brought in six outside procurement officials from NATO, also on a sole-source basis. As with the Lockheed contract, lower level UN officials raised concerns, that such outsourcing was not normal, that NATO is not a UN-registered vendor and that there would be a lack of accountability to the UN by the NATO personnel. As reflected by the Headquarters Contract Committee minutes, which Inner City Press has obtained on an exclusive basis from whistle-blowers and now places online here, the HCC recommended the consideration of "other mechanisms" and "other sources of procurement officers." Despite this recommendation, the sole source NATO contract went through, as did the $250 million contract to Lockheed Martin. Inner City Press on Tuesday asked the head of the UN's Department of Peacekeeping Jean-Marie Guehenno about the claim that the contract had to go sole source (or "single source," as Mr. Guehenno called it) only after the Security Council's July 31 resolution on the Darfur hybrid force. An April 19 memo from the UN's Jane Holl Lute argued even then for "a sole source contract with PAE," Pacific Architects and Engineers, the Lockheed subsidiary. Click here for the memo, and here from the HCC minutes, which recite that the U.S. Department of State, after its own sole source deal with Lockheed's PAE, had finally put the contract out to bid, with DynCorp also a finalist. Only then did the UN take over (or "inherit," as Mr. Guehenno put it) the contract, also on a sole source basis with Lockheed's' PAE. At Tuesday noon briefing, Inner City Press asked UN Deputy Spokesperson Marie Okabe to explain how the previous defense of the no-bid contract, that competition was not possible after the July 31 Security Council resolution, with the April 19 date of Ms. Lute's request to go sole source to PAE. 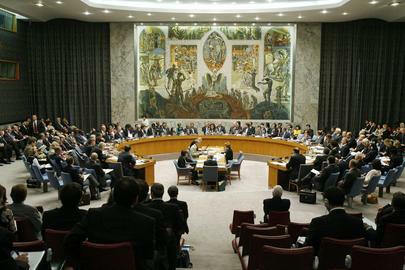 Ms. Okabe, as best as Inner City Press could make out, maintained that the July 31 Security Council resolution was the answer. Video here. She said that "procurement" made the decision. A UN source told Inner City Press, anonymously due to fear of retaliation, that contracts are steered not by Procurement Services but by those who design the specification -- in this case, the NATO staff brought in, themselves on a sole-source basis. Later on Tuesday Mr. Guehenno repeated that "the formalities for requesting" cannot precede a Council resolution. Asked by Inner City Press about Ms. Lute's April 19 memo, Guehenno said, "I would have to check." News analysis: Here's another thing to check, about which Inner City Press also asked Mr. Guehenno: issues of overcharging by PAE for airfield services in the Democratic Republic of the Congo in 2001. "You are right," Guehenno said. But then why the push to give PAE this sole source contract in April 2007, even before the Security Council resolution? And based on the American-to-American perception of the contract, diplomatic source indicate that the call that the Department of Field Support go to a developing country has only grown, and has been strengthened by this irregular no-bid contract. Guehenno was also asked about comments by "one French official" that "Paris was very surprised" by the UN's sole source contract to Lockheed Martin's PAE. [This "French official's" comments have been confirmed to Inner City Press by multiple sources; the official is being left unnamed out of respect for these other sources, who may have be subject to an "off the record" or "not for attribution" agreement, to which Inner City Press is not a party.] Mr. Guehenno replied that "I haven't explained to them how peacekeeping works," a comment subject to at least two different interpretations. One observer of the process, anonymous due to fear of retaliation, describe the process this way: the U.S. couldn't continue on a no-bid basis with PAE, and so had the UN take over the contract, and the payments, still on a no-bid basis. Developing. The UN's Office of Legal Affairs, in a May 31, 2007 memo also placed online here, said "we are concerned about the lack of authority or control the UN would have in respect of contractor's personnel carrying out UN procurement functions." Ironically, Inner City Press on November 6 was told by numerous well-placed sources that OLA has become so concerned about the November 2 publication of HCC minutes about the Lockheed contract that a legal analysis is being solicited or prepared to argue wrongdoing by Inner City Press and this correspondent in publishing the minutes. The argument, Inner City Press is told, would center on the "Notice of Confidentiality" on the minutes, which states that "authorized UN staff who are provided with a copy of this document, or otherwise come into its possession, are hereby informed that the document is for official UN use only and may not be shared with any party external to the UN." The UN is free to so-label its documents, but the press is not bound by the labeling. In fact, investigative journalism is based on obtaining documentary evidence of possible institutional irregularities. Journalists consulted Tuesday about OLA's theory were scornful. One, however, noted that the UN has in the past sought to intimidate whistle-blowers even by searching phone records; intimidation of journalists, he said, would be something new. Watch this site.